This dog was foaming at the mouth. When a vet looked inside, he found something truly bizarre. Ladybugs get into a dog's mouth on pieces of grass and then settle in on the dog's gums. The insects can bite painfully, plus what they secrete through their legs causes burns on the sensitive internal surfaces of dogs' jowls as well as on their tongues. Excess salivation and foaming at the mouth are both signs of a bug infestation. Luckily it's easy to remove the little intruders with your fingers or a spoon. But then a vet should treat the dog's internal injuries. The affected pooch from Kansas has meanwhile recovered. Her owner is now much more cautious, when she starts exploring in the grass. My #dog Ernie caught eating some grass. 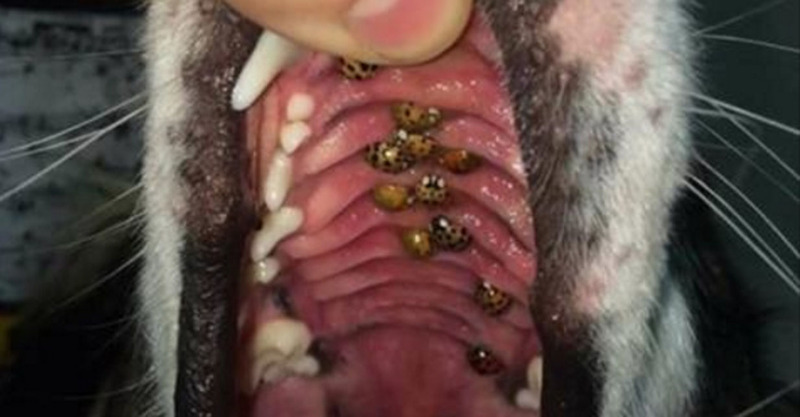 Share these pictures with your animal-loving friends so they'll be able to recognize the symptoms of ladybug-infestation in their four-legged friends!